Party ahoy!! Sail to worlds beyond your imagination with our pirate crew for hire and discover hidden treasure on the ultimate pirate party adventure in Perth! 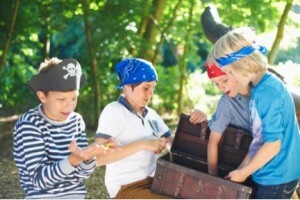 When Captain Swashbuckle attends your kids birthday party, non-stop action packed pirate party ideas will abound including a laugh a minute magic show, balloon art, funny props, face painting, temporary tattoos plus pirate party games. 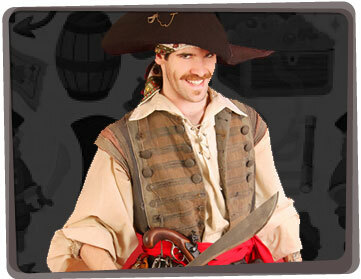 The only thing you need to consider is the pirate party food! We also like to ensure that every birthday child is aware they’re special, that is why they will be given an extra modelled balloon Pirate hat and balloon sword during the magic show. 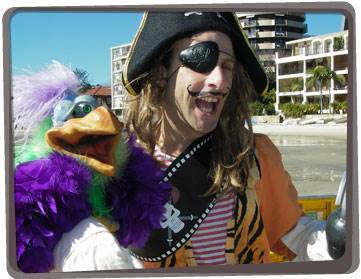 Our swashbuckling captains are often asked to perform at all types of pirate themed parties for kids in Perth as well as at other events including: product launches, shopping centres, christenings, birthday parties, promotional events, product launches, fairs, christmas parties and just about any other event under the sun. Hi Yabadoo, We had a great day yesterday and our birthday boy confirmed that we're the “best parents in the universe” after hosting a great birthday party. Billy Blacktooth was fantastic!!! He was on time, had an enormous amount of energy and he managed to captivate the adults at the party also. He was professional and pleasant to deal with right from the start, as was the Yabadoo sales team with our first phone call. We were most impressed and will definitely book with Yabadoo for any future entertainment needs. Many of the parents at the party asked where we found him so I will be sure to pass on your details to them all. Thanks again, Tammy W.
Create hook prosthesis for your little pirates! Purchase large colored cups that are big enough for a kid to put his/her fist into. 16-oz cups can fit young kids. At the bottom of the cup, cut an X hole and insert a wrapped candy cane in it. Make sure the hook is at the outside part of the cup. Fill a large bowl with pretzels. Have the pirates “hook” as much pretzels as they can within 1 minute. The pirate that hooks the most pretzels wins, but all the kids get to eat all the pretzels they have gotten!